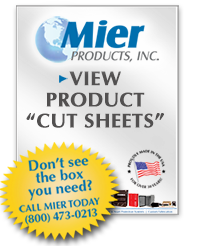 Mier’s extensive line of durable polycarbonate boxes offers a solution to most installation problems when it comes to size, style, and convenience. 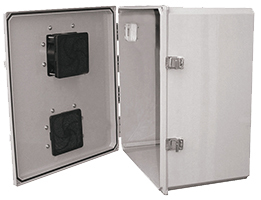 In addition to the enclosures listed here, Mier manufactures cost-effective and highly customizable metal enclosures, and offers a line of high quality Cam Locks to take security one step further. 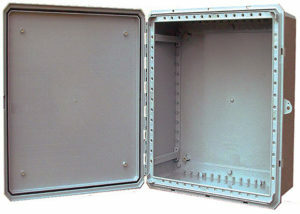 Click the Enclosures, Cabinets, Boxes or Cans tab above for other enclosure styles. 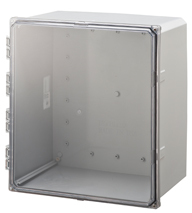 Every model comes standard with mounting system, gasket, multiple standoffs for easy back-panel/component/DIN rail installation, F1 UV protection, warp resistance, removable doors, lockable latches, and UL designation stickers. 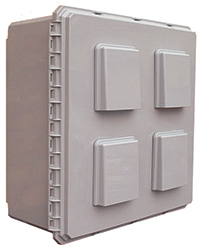 Every model has the following options: standard gray doors or clear doors, metal or plastic back panels, back-panel adjustment kit which allows “stacking” of panels or raising the panel farther off the back. All models can be customized for quantities of 25 or more. 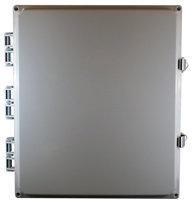 Custom Screen Printing is also available. 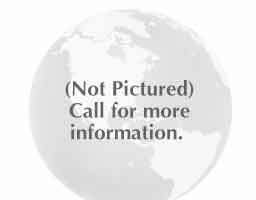 Call for information. 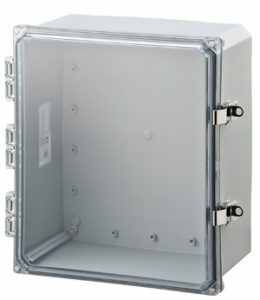 Don’t see the enclosure you need? Go to our Custom Metal Fab page and download the design-a-box kit, or give us a call at 1-800-473-0213. 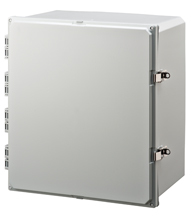 Do not mount enclosures equipped with air-conditioners on outside walls of apartments, offices, condos or homes to prevent AC vibration from becoming a nuisance to those who live/work on the other side of the wall. 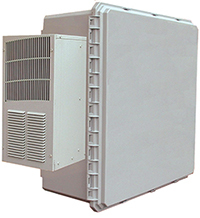 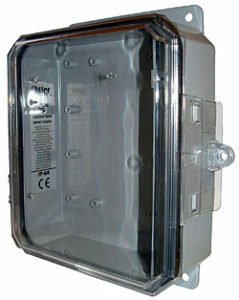 Just as a home or business’ AC units are mounted a few feet away or on the roof to prevent noise to those who live/work within, Mier recommends mounting temperature-controlled enclosures on concrete pads using angle-iron or poles, or mounting them on walls not common to living/work areas within. 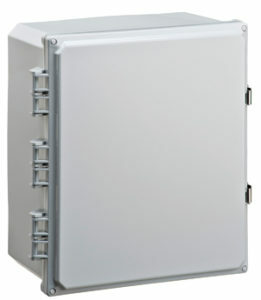 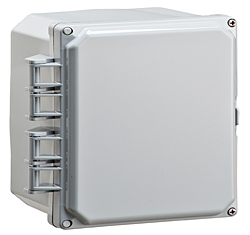 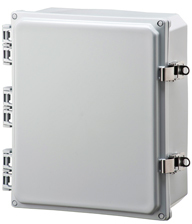 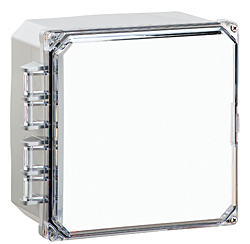 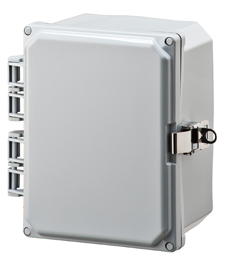 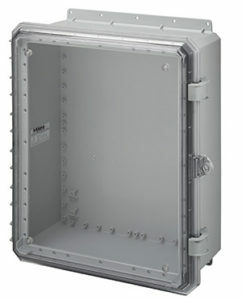 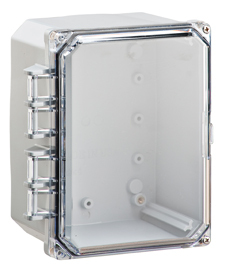 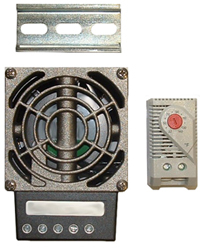 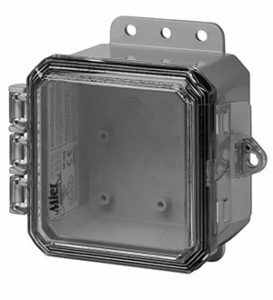 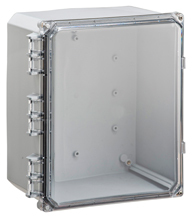 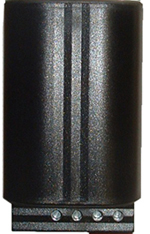 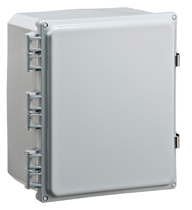 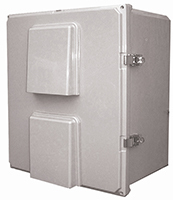 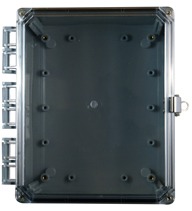 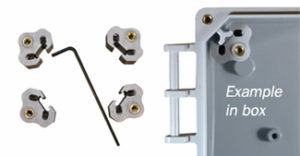 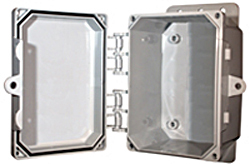 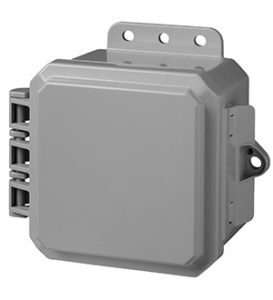 Non-metallic polycarbonate enclosure allows you to place transmitters/ receivers inside! 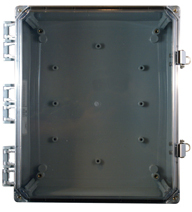 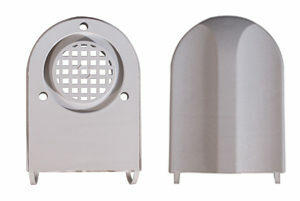 Plastic vent for non-metallic enclosures (outdoor applications) Three mounting holes must be cut into the enclosure to use this vent.